Picture from Henk of Holland website, used with permisison. I wanted to build a "what-if" vehicle, assuming the vehicle went into production at the end of the war and was captured (and used) by the Germans. July 1943 - August 1944. 2339 vehicles. Rear plate of superstructure is sloped. Bulge to the left of the gun in the glacis for the gun sight. Early vehicles (1943) had appliqué armor for the commander's cupola, rounded beak, 4 bolts for the gun collar instead of 6 and no track links on the bow. Early Summer 1944: smoke dischargers installed on rear plate. September 1944 - November 1944. 315 vehicles. 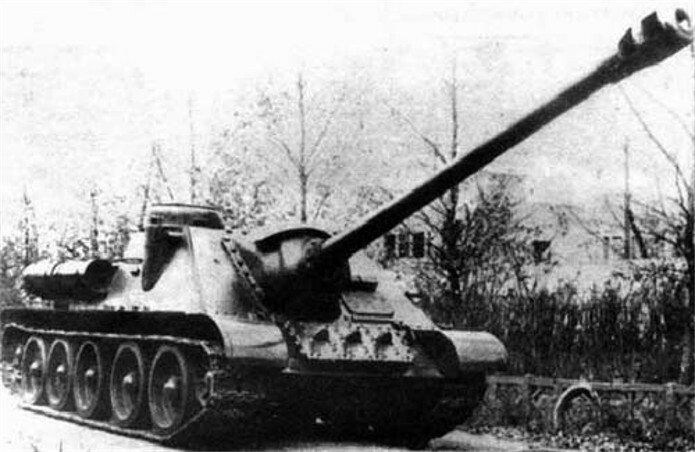 Late vehicles had the same, wider, gun mount as the SU-100 (but with a different collar). November 1944 - well after WW2. +/- 1400 produced during the war. Slightly different gun collar with respect to SU-85M. Before January 1945 twin hatches for the commander were used, afterwards a single hatch. Late vehicles had a loader's hatch that extended into the rear plate of the fighting compartment; early versions only had a pistol port and vision slit. Late vehicles (post-war ?) no longer had the plate to eliminate a shot trap between the fighting compartment and the engine deck. Apart from the wheels, the gun collar and plate for the shot trap, this is mostly correct, based on the pictures of the prototype and the features typical at the time the prototype was built. Step 1-4: assembly of lower hull. While the boxtop shows the early blunt nose, the kit instructions want you to install the sharp nose. I went with that, as the prototype already had this nose . Note that the rubber tyres (part 2F) are not symmetrical even if they would appear so at first sight. If you don't pay attention, they will not fit properly. There are no alignment pegs for the wheel halves. Pay attention that the holes lign up. 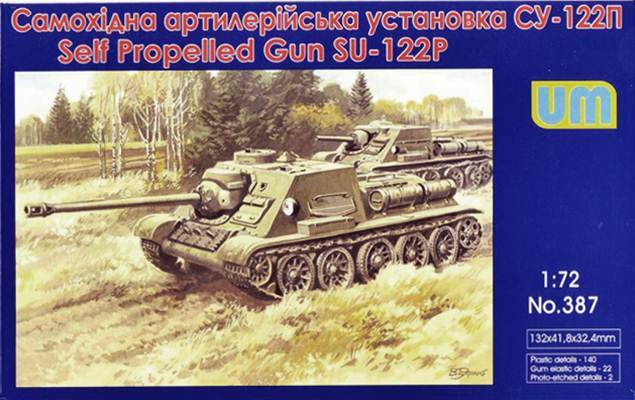 Note that the prototypes of the SU-122P, apparently like all SU based on the T-34, had solid wheels. I do not know why UM chose to give spider wheels, but it went well with my "what-if" concept. Admittedly, they were sometimes fitted in the field as replacements, as were all-steel wheels. If I am not mistaken, then the swing arms labeled "33A" should go on the right while "31A" should go on the left. I have the impression the instructions are wrong here. The separate swing arms are a very nice touch if you want to articulate the suspension. At this point I would recommend not gluing the drive wheels (which are at the rear on the T-34) to ease the placement of the tracks. I kept the latter off until the upper and lower hull were mated together. I gave it some thought, but couldn't find any reason why mating the front and the rear of the upper hull first, before gluing them to the lower hull, would be a good idea, so I decided to add the front of the upper hull to the lower hull first after which I added the engine deck. Worked fine. Parts 114D and 176E (gun mount) fitted badly. I think I added them to the fighting compartment too soon; I should have worked more on the gun assembly before doing that as it gave me all kinds of trouble the way I did it. Very late in the painting sequence, I lost part 80B (antenna mount). There was no other solution then to scratchbuild a replacement. I decided to fit fewer handrails and replace them with metal wire, as removing and sanding the plastic handrails proved neigh impossible. Their placement is solely based on my personal taste. I also decided to drill out the exhausts. The exhaust assemblies were added to the rear of hull on sight, as any form of locating peg is missing. (Actually, there are no locating pegs whatsoever in this kit, not for the exhausts, not for the handrails, fuel tanks, cupola, or whatever.) The rear of the hull is striated, by the way, as if it were 3D printed. When adding the external fuel tanks, take care to assemble them so that the fuel cap faces upwards. Did I mention that UM doesn't provide locating pins ? As a consequence, it might be that I placed mine too far aft (even though their position seems to vary). For the same reason I might also have positioned the tow shackles too low. The gun barrel was replaced with a metal barrel from RB Models, while the PE engine mesh went on better than expected, after annealing and carefully bending it. While the instructions make a vague mention of the tow cables, it is not clear where they are supposed to go and they are (in my opinion) horrible anyway, so I left them off. As I was going to fit Schürzen, the beads on the fenders were shaved off; I also replaced the curved front fenders with angular ones (which are also provided) as these went better with my late war setting. I took some liberty with the stowage on the fenders, adding spare tracks and sundry bits from the spares box. Note that UM is one of the few (only ?) manufacturer to provide positionable driver's visors. The driver's hatch can also be opened and has some detail on the inside. As the hatch is rather big, and as the interior is just a gaping hole, some scratchbuilding might be needed to attract the attention of the unwary admirer. 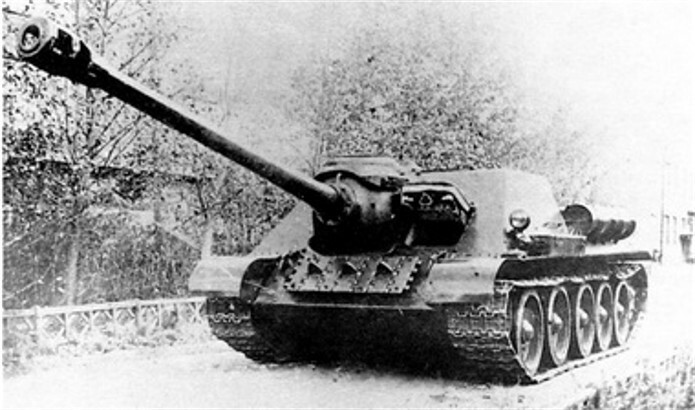 Note that the SU-122, SU-85, SU-85M, SU-100 had a small idler adjustment hatch on the lower bow (on the left when seen from the front), which is not present on the T-34. Neither is it on this kit. A small detail that is often overlooked in T-34 based SUs is the small triangular plate in the area where the fighting compartment meets the engine deck. Based on the history given above, all wartime SUs should have had it. In hindsight, I should have added it. I finished my vehicle as a Beutepanzer, which gave me a lot of freedom. It also allowed me to avoid using the decals which looked excruciatingly flat to me. Having heard of their appetite for silvering, I think I made a good choice. Decals came from the spares box, with the large crosses from a Superscale sheet for Luftwaffe bombers. These react delightfully to setting solutions and were thus perfectly fitted to be used on the engine deck. SU-85 and SU-100 on the battlefield, Neil Stokes, World War Two Photobook Series 9. Peko Publishing.